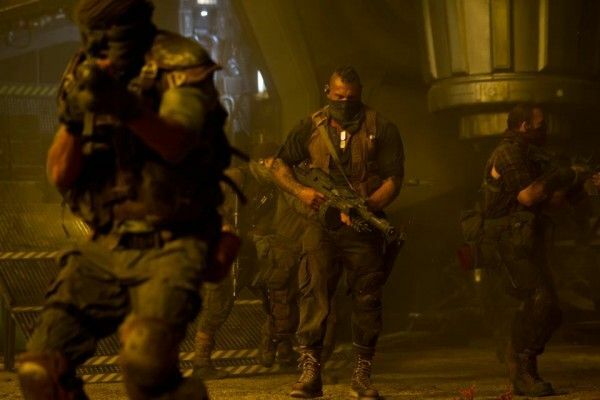 Continuing with star Vin Diesel’s stream of set photos and images from Riddick, the actor unveiled a new image from the film today giving us our first look at the mercs. The third installment of the series that began with Pitch Black was followed by 2004’s The Chronicles of Riddick finds our antihero left for dead on a sun-scorched planet that’s infested with alien predators. Riddick activates an emergency beacon that alerts mercenaries to come collect their bounty: one ship carrying a new breed of merc and another ship captained by a man whose pursuit of Riddick is incredibly personal. This image shows us some of the mercs, and I’m fairly certain the one in the center is WWE star David Bautista. Hit the jump to check out the image. The film also stars Katee Sackhoff, Jordi Molla, Matt Nable, Conrad Pla, Raoul Trujillo, Nolan Funk, Keri Hilson, and Bokeem Woodbine. Image via Vin Diesel’s Facebook.